very interesting book, if you like history and stories about people you will appreciate this one, nobleness, madness, genius and murder; you couldn't make this stuff up. This book was selected for a book club and very much outside of what I would normally read. The narrator did an excellent job telling the story of James Garfield. The book was well written and full of interesting facts about not only Garfield but his assassin Charles Guiteau, inventor Alexander Graham Bell, and others. I was equally impressed with both the incredible book and the narration. I did not know anything about James Garfield but what a man. The description of the time, the people and the character of a nation was really fascinating and I would recommend this to anyone interested in U.S. History and a good story teller. I was fascinated about the life of President Garfield. I never knew much about him and to hear how politics and innovation met was very interesting. It's too bad they didn't have body guards for presidents after Lincoln's assassination. I am not necessarily a history buff, but I stumbled on this! So glad I did! This audiobook was fantastic! 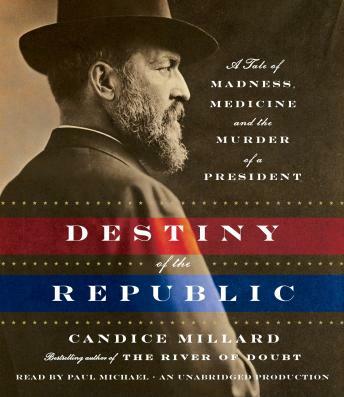 I did not know anything about President Garfield (and wasn't sure I was missing much), but I found the story fascinating. I didn't know anything about the connection between Garfield and Alexander Graham Bell, so this was a bonus. The narration was also very well done. The book was easy to follow. I listened to it without taking a break. I wish all history audiobooks were this interesting! This book was great! I knew so little about the assassination of President Garfield, and the author really put it all into context. This book also did a great job of describing the state of medical care in the 1880's (which actually killed Garfield - not the bullet itself). Finally, I have a deeper appreciation of the genius of Alexander Graham Bell.